Manhattan Rickshaw Company (@manhattanrick), operating since 1995, is an industry leader in pedicab event production, media activation, and driver involvement (including appearances on "The Apprentice"). See what we mean by our commitment to this green form of out of home advertising we call "performance media" for your next activation. Shuttle your guests and VIPs in branded, congestion-busting pedicabs wrapped in your company's logos to and from your Manhattan events and headquarters, protected from the elements by canopies and wind - guards. There is still time to engage our services for Febuary Fashion Week events. 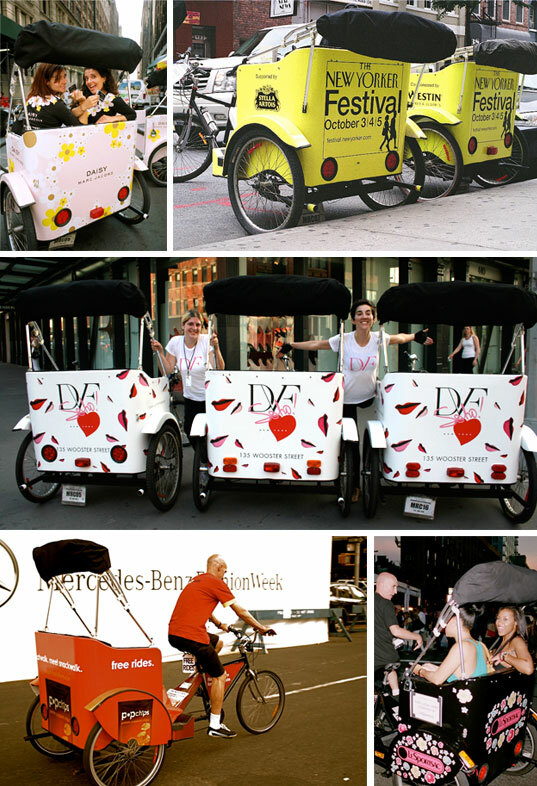 We can prepare eye-catching one-piece wrap around vinyl panels and team them up with some of the most senior drivers in the industry for a stunning Fashion Week pedicab activation.